Wouldn't it be nice to hit the tracks in any Mario Kart game and have a pure racing experience? No items on the tracks, and the only way to win is to drive the best? Turns out that almost happened in Mario Kart 64! 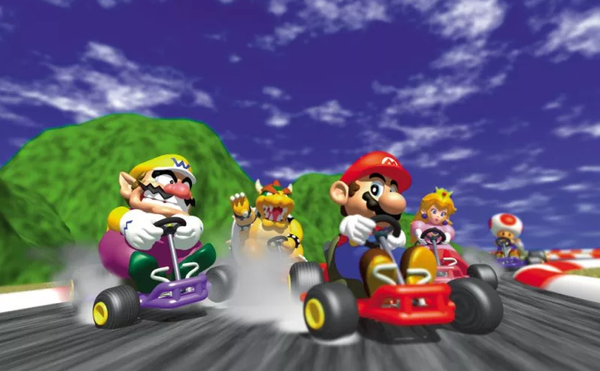 Hideki Konno, Director on Mario Kart 64, shares details on how this mode was considered, but scrapped. In fact, originally we had a “no item” racing mode too. It was our attempt to appeal to F-Zero fans, who feel that items are a distraction to the racing. (laughs) It allowed for serious races, where you’re trying to edge someone out for fractions of a second, with all the racers clumped close together in the final lap. As it turned out, however, almost everyone who demoed Mario Kart 64 chose not to play that mode, and we ultimately dropped it. In a traditional racing game you would of course include a mode like that, but Mario Kart without items somehow felt kind of cheap. (laughs) So we cut it out. I guess that for people who just want to race, there’s always the time attack mode. You can now save your best times in the controller pak, so I’ll be happy if players can find new challenges for themselves in that mode. No items Mario Kart, 1v1 race: It&apos;s basically competitive Smash Bros! If they had done so, we would probably have frequent re-releases of the Nintendo 64 controller for newer consoles. I don&apos;t know. Does anyone honestly prefer the N64 controller over literally all future Nintendo controllers? The GameCube controller was super comfortable, so I can understand people loving it, but Nintendo wasn&apos;t even confident in its big N64 feature, the analog stick, to place it in a normal two-handed grip position, and instead added a weird third prong as a just-in-case a game used it. I would love to see a no-items Mario Kart mode though. It could make it a more competitive game for sure. I was joking -- referencing to Smash Melee situation. And I like your nick, Mr Snow. Now I want a Mario Kart equivalent of "no item Final Destination", which means no item and just a straight line with no turns. I’d love a no-items mode in Mario Kart. Or at least no items like Blue Shells, limit red shells to 1, no lightning and no Star. I play Mario Tennis Aces Online with the special moves turned off. In contrast, I’d never play Smash without items. Aren&apos;t there rules in newer Mario Karts where you can play with no items?